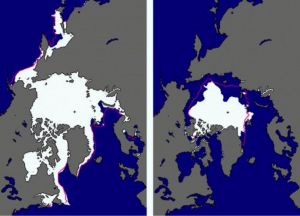 Another factor favoring this craze towards the Arctic is the ice cap melting faster than expected which creates a free marine passage between Europe and Asia. If companies are about to hit a great deal, we must fear the impact of Arctic natural resources exploitation on wildlife habitats, which are already undermined by the effect of climatic changes. In this context, our attention turns toward the polar bear, the emblem of the Arctic, because it will have to adapt to major changes in its habitat. Recall that the Arctic name comes from the ancient Greek ἄρκτος (Arktos) meaning bear in reference to the constellations of Ursa Major and Ursa Minor, both located near the north celestial pole. We propose here to give an overview of polar bears actual situation (Ursus maritimus) throughout the circumpolar world. 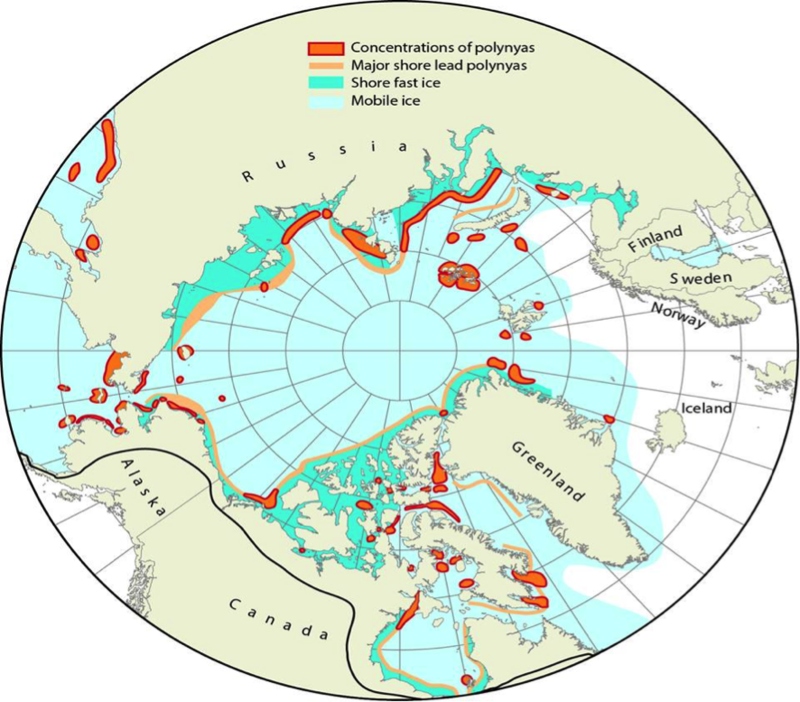 We will present the phenomenon of melting ice which is considered as the main threat to bear’s habitat and we will outline the main elements of the the species management plan, coordinated and implemented as a cooperative effort between the Arctic states of Canada, Norway, Russia, the United States and Denmark. 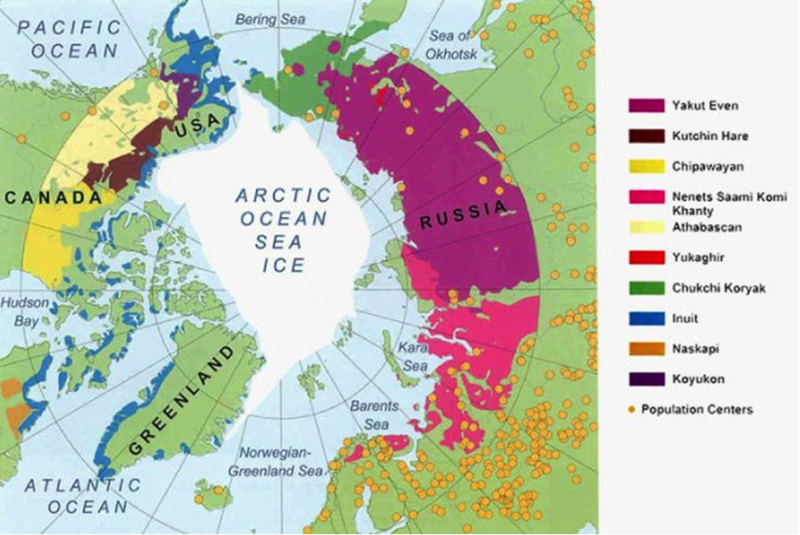 The Arctic is a vast area covering about 18 million square kilometers, representing an even greater surface than the russian territory of 17,098,242 square kilometers. Caracterized by long, cold winters contrasting with short, cool summers; this area receive few solar radiation due to its inclination toward the tropics (where the sun is directly overhead). During the theoretically six month lasting winter, the sun is completely absent. The temperatures are usually below – 10 ° C, but they approach 0 ° C at the North Pole in July and August. “The polar night lasts about five months, after which arises a one month period of days and nights alternance. At first, the days are very short, and then they gradually lengthen to last 24 hours reaching what we call the polar day, which lasts about five months ” (http://www.larousse.fr/encyclopedie/autre -region / Arctic / 106015). (http://www.underthepole.com/milieu -polaire / the-peoples-de-larctique /). 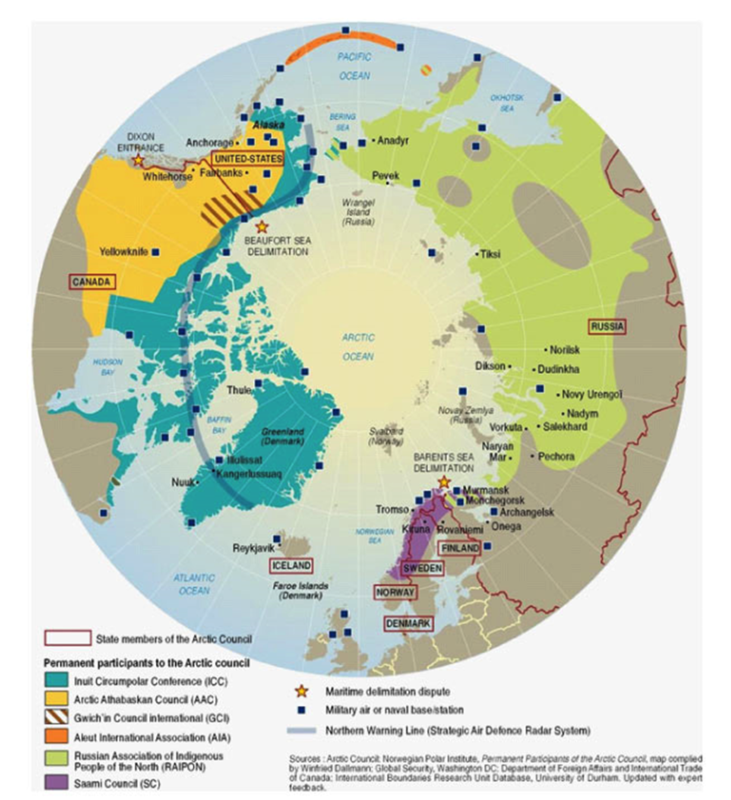 Arctic nations are grouped around six organizations for the defence of their rights and their political and economic interests. We have the Saami Council – SC, the Aleut International Association – AIA, the Arctic Athabaskan Council – AAC, the Inuit Circumpolar Council and the Gwich’in Council International – GCI (http://www.underthepole.com/milieu-polaire/les-peuples-de-larctique/). The polar bear, also called the Lord, is the emblem of the Arctic. It is the largest urside of the planet and most likely the deadliest Arctic predator. Powerful symbol of strength and resistance, this tireless hunter sees its survival threatened by global warming. Its critical habitat depends upon the presence of delicate sea ice on which the very foundation of the entire Arctic ecosystem is balanced. This sea ice is now literally melting between the polar bears’ legs. Its scientific name Ursus maritimus means “sea-bear” a great fitting name for an animal who spent most of its lifetime in the freezing water (http: //www.wwf.ca/fr/conservation/arctique/faune_arctique/ours_polaire/). Figure 5. On the Hudson Bay during a hunting trip north of Sanikiluaq (ᓴᓂᑭᓗᐊᖅ) on the north shore of Flaherty Island Belcher Islands in Hudson Bay in the Qikiqtaaluk region of Nunavut Canada. It is the southernmost community of the territory. Photo taken in February 2015. Source: Piita Kattuk, member of the Eeyou Marine Region Wildlife Board. According to data harvested in the circumpolar Management Plan – Draft – 2014 the population of polar bears has been estimated at 20 000 to 25 000 individuals. Canada displays the largest coastline inhabited by polar bears, followed by Russia, Greenland, the United States and Norway (see Figure 7 and Table 1). This large area of over 22 million square kilometers is mainly composed of Canadian Arctic archipelago, recognized for its large biological productivity, which most certainly justifiies the preference of polar bears for the region. Their number in the area is estimated at 16,413 individuals, where more than the two third of the total population is found in 13 of the 19 Arctic subpopulations (Management Plan – Draft – 2014). Polar bears’ most active denning area is found on Akimiski Island in James Bay, Canada. Despite a confirmed presence in High Arctic around Ellesmere Island and northern Greenland, polar bears are more active in southern areas. This geographic repartition could be explained by better ice conditions in southern areas and the lack of food in deep waters.”(Draft Management Plan -. 2014). 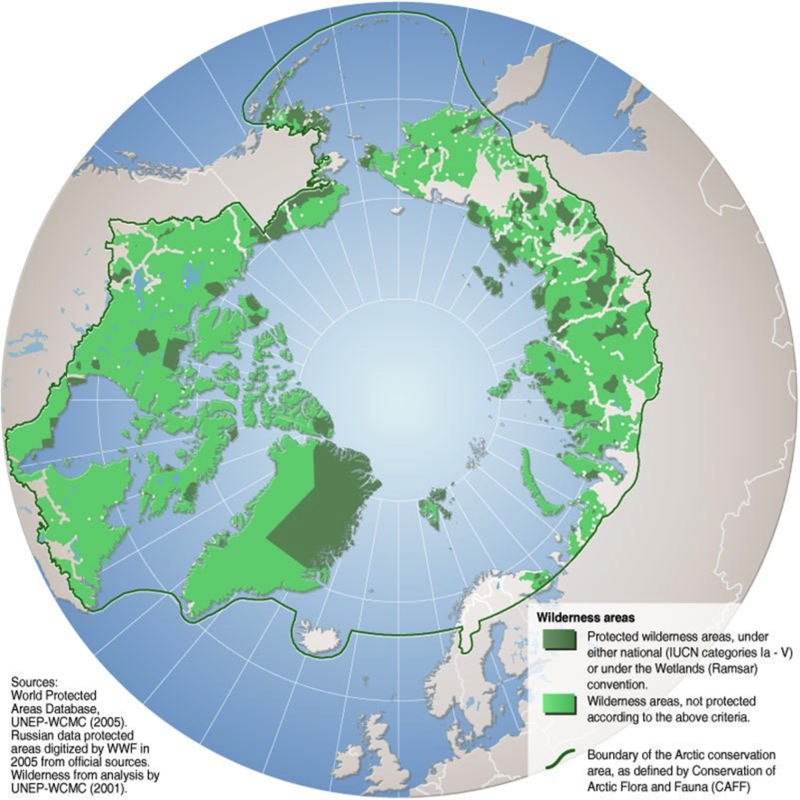 Arctic Basin (AB): Unknown Population; area of the management unit: 4,233,530 km2 Territory: Circumpolar Region. Baffin Bay (BB): Estimated enrollment of 1,546 individuals in 2004 on an area of 1,078,840 km2 – Territories: Canada (Nunavut) and Greenland. Barents Sea (BS): Estimated enrollment of 2,644 individuals in 2004 on an area of 1,691,458 km2 – Territories: Norway and Russia. Sea Tchoukthes (CS): Estimated enrollment of 2,000 individuals in 1993 on an area covering an area of 1,836,922 km2 – Territories: Russia and the United States. Davis Strait (DS): Estimated enrollment of 2,158 individuals in 2007 on a space with an area of 2,620,106 km2 – Territories: Canada (Nunavut, Quebec, Newfoundland and Labrador) and Greenland. Kane Basin (KB): Estimated enrollment of 164 individuals in 1997 on an area of 166,514 km2 – Territories: Canada (Nunavut) and Greenland. Kara Sea (KS): Unknown Numbers – area of 1,763,680 km2 – Territory: Russia. Lancaster Sound (LS): Estimated enrollment of 2,541 individuals in 1998 on an area of 487,532 km2 – Territory: Canada (Nunavut). Laptev Sea (LP): From 800 to 1200 individuals in 1993 over an area of 2,459,282 km2 – Territory: Russia. Southern Beaufort Sea (SB): Estimated population of 1,215 individuals in 2014 over an area of 715,030 km2 – Territories: Canada (Yukon, Northwest Territories) and the United States. The establishment of the situation on the 19 subpopulations trends shows that over the last twelve years, researchers based on the Detroit M’Clintock saw one subpopulation size increases, three others decrease and six remained stable. The remianing subpopulations size remain unknown (http://pbsg.npolar.no/en/status/status-table.html). We just learned that the Norwegians and the Russians will cooperate for counting subpopulations of their territory which have not been done over the last 11 years (barentsobserver.com). The polar bear is an excellent swimmer. His thick layer of fat allows him to keep warm and helps flotting. His large feet serve as oars. It can swim up to a speed of 10 kilometers per hour and cover a distance of 90 kilometers without stopping. He can hold his breath under water for one minute (http://www.canadiangeographic.ca/kids/animal-facts/polar_bear.asp) (Figure 9). Figure 9. On the Hudson Bay during a hunting trip near Sanikiluaq (ᓴᓂᑭᓗᐊᖅ) located on the north shore of Flaherty Island Belcher Islands in Hudson Bay in the Qikiqtaaluk region of Nunavut in Canada. It is the southernmost community of the territory. (http://www.wwf.ca/fr/ conservation / Arctic / faune_arctique / ours_polaire /). The females give birth every three years. They usually give birth to one or two offspring, it can be up to four cubs per litter. 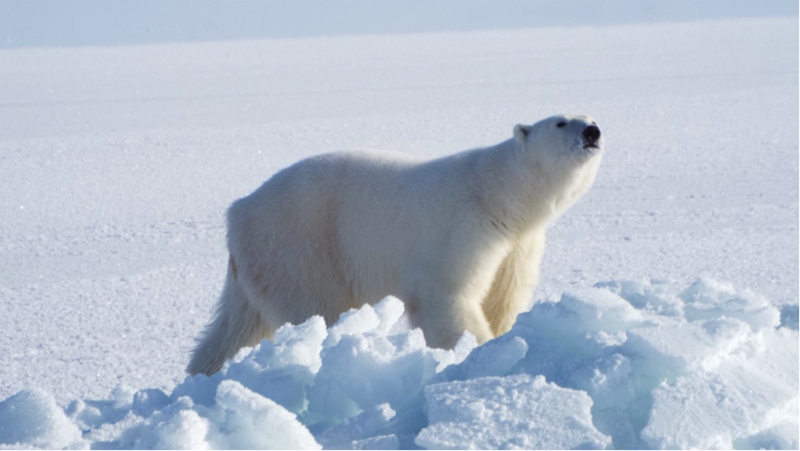 According to the Polar Bear Specialist Group (PBSG), the main threats to the polar bear habitat is melting sea ice due to climate change, diseases, deaths caused by man, and oil activities gas, mining, contaminants, navigation and tourism. 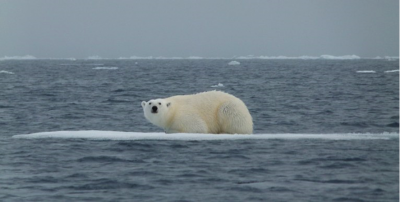 Given the crucial importance of the presence of sea ice for the polar bear we provide an overview of the process of melting and thinning observed for the last thirty years, and then an idea of the risks surrounding the oil and gas. 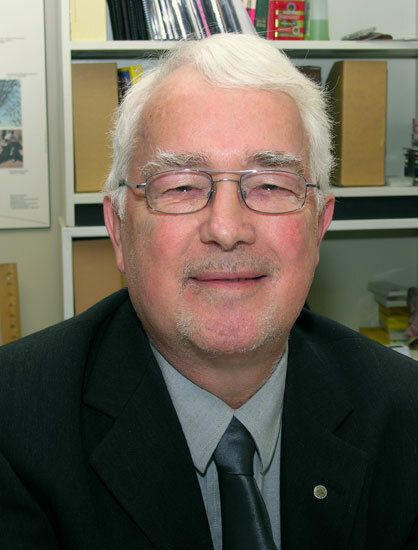 According to Michel Alberganti, using data from the Goddard Space Flight Center, “the surface of the Arctic Ocean covered by ice has reached 5.83 million square kilometersin 2013, against the minimum of 4.34 million square kilometersregistered in August 2012, and even 3.41 million square kilometersSeptember 16: “In 2012, the coverage rate did not exceed half the average recorded between 1979 and 2010” (http: //www.slate.com / life / 77458 / Kick-cold Arctic) (figure 10). Indeed, in 2012, according to analysis and preliminary observations from the National Snow and Ice Data Center (NSIDC) (University of Colorado at Boulder), the Arctic sea ice reached its lowest level in over 30 years! An alarming trend according to scientists. 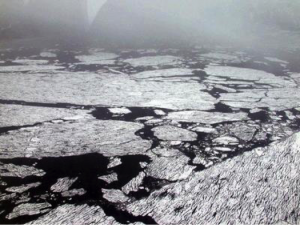 “For the first time, Arctic sea ice reached its lowest since satellite observations (1979), beating the 2007 record. 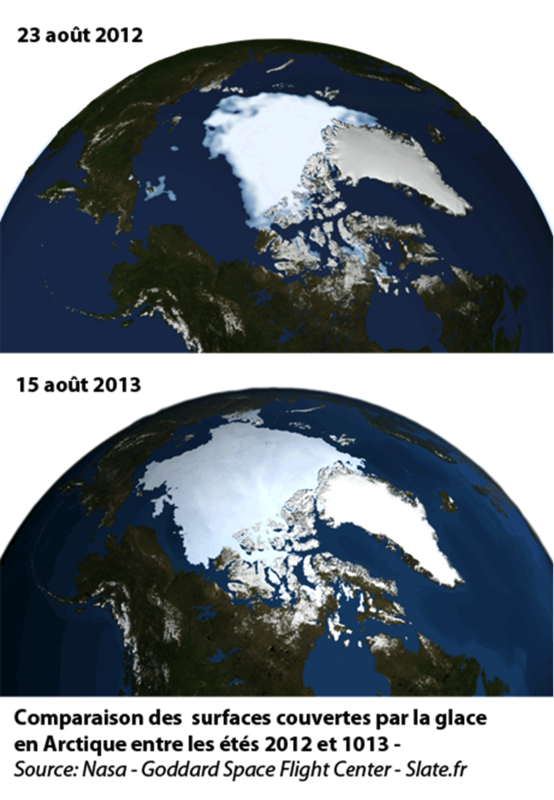 The extent of sea ice was only 4.10 million square kilometersin August 26 2012. This is 70,000 square kilometers less than the previous record registered on 18 September 2007. This corresponds to a loss equivalent to the size of Ireland. 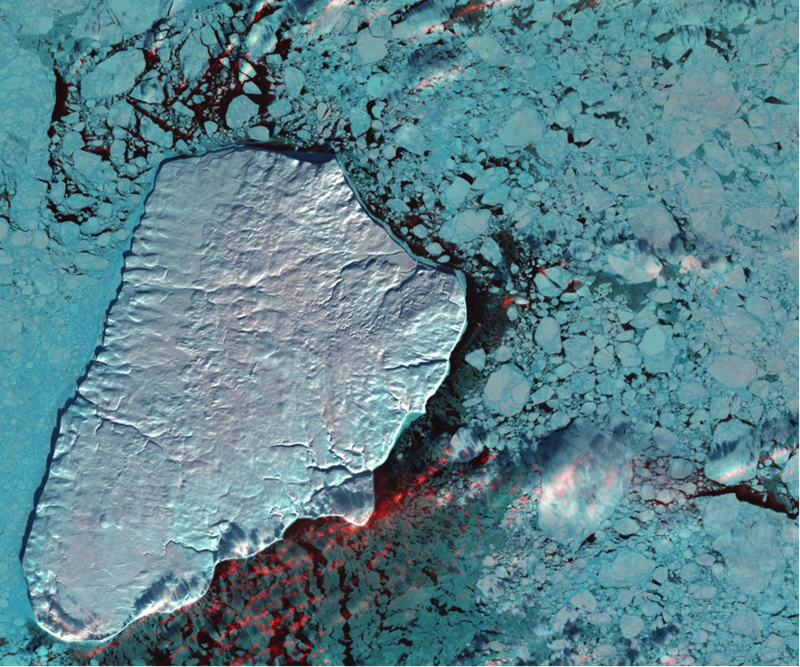 On 5 September 2012, the ice was still melting with an area of less than 4 million kilometers square, about ten days after the end of the Arctic melt season “. 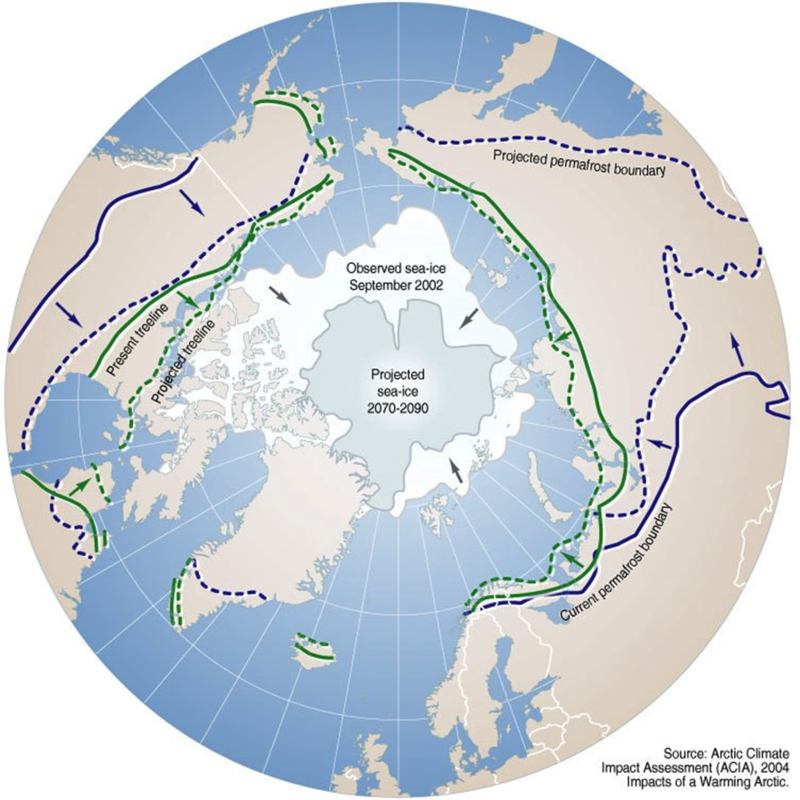 Under the Arctic Sea Ice News & Analysis’ the extent of sea ice in December 2014 (Figure 12) showed an average of 12.52 million kilometers square, or 540,000 square kilometers below the average observed between 1981 and 2010 of 13,060,000 square kilometers and 500,000 square kilometers above the record for the month observed in 2010 “. 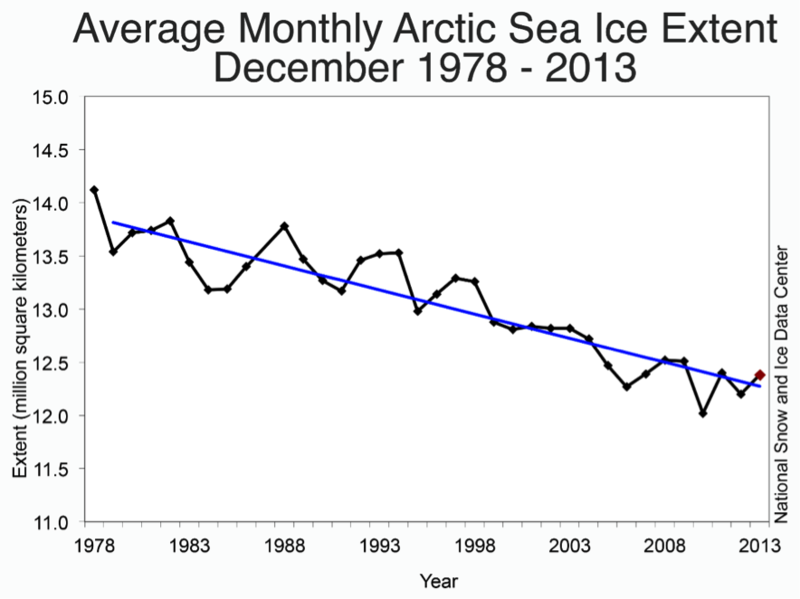 As of March 20, 2015, the maximum ice extent of the Arctic Ocean appears to be the lowest ever measured. The maximum extent of Arctic ice was the lowest measured in winter this year since the beginning of satellite observations in 1979, said the American Center of snow and ice (National Snow and Ice Data Center / NSIDC). 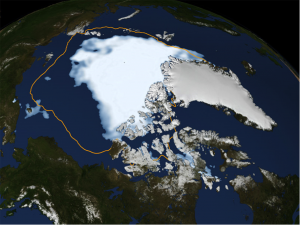 The surface of the sea ice has reached more than 14.54 million square kilometers on 25 February, which should be the maximum for the year, according to a preliminary estimate, representing 1.10 million square kilometers below the average of 15.64 million square kilometers measured from 1981 to 2010 and 130,000 square kilometers below the previous minimum in 2011. This year, the maximum was reached two weeks earlier than the average between 1981 and 2010 according to the NSIDC. The date of the maximum extent of Arctic sea ice varies considerably from year to year from 24 February 1996 at the earliest to 2 April at the latest in 2010, specify these scientists (levif.be). During the 2014-2015 winter, the ice in the Arctic Ocean rose by 9.91 million square kilometers, a much lower increase compared to 2013-2014, which saw a record increase. The low ice formation during this last winter was partial in February characterized by an unusual combination of the jet stream, which resulted in an Arctic warming of Pacific Ocean causing a small extent ice in the Bering Sea and Okhotsk. During the first two weeks of March, temperatures across the Arctic was about several degrees above average up ten degrees in the Barents Sea northern Norway, said the NSIDC. Using modern measurement techniques (since 2000 the records were replaced by a host of airborne measurements and satellites, as well as other data collection methods directly on or under the ice) and historical data, Washington University researchers were able to observe the way in which the thickness of Arctic sea ice has changed over the past decades. The study, published in The Cryophere, shows that the ice in the central Arctic Ocean has thinned by 65% between 1975 and 2012 from 3.59 m to 1.25 m.
The thinning is even more marked in September when the sea ice is at its thinnest after the summer melt. During this 37-year period of observation, the thickness of the ice in September has thinned by 85%, from 3.01 to 0.44 m: “The ice has thinned considerably said the Lead researcher Ron Lindsay, a climatologist from Applied Physics Laboratory of the University. We knew the ice was thinner, but we now have further confirmation on the speed with which the phenomenon occurs and we can see that it does not slow down ” (http://barentsobserver.com/en/nature/2015/03/arctic-sea-ice-thinning-dramatically-study-finds-06-03). 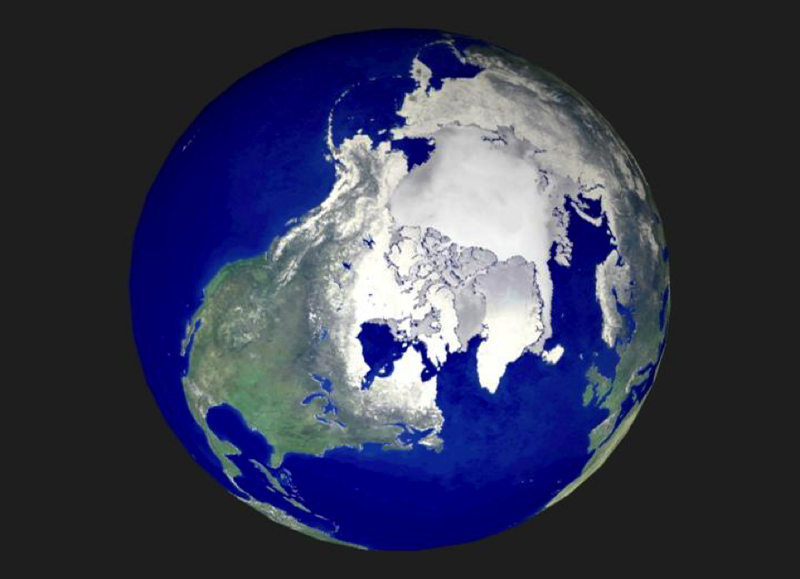 The scenarios presented by the Arctic Climate Impact Assessment (ACIA) shows a significant increase in temperatures in the Arctic, greatere than in many other parts of the world, which can have impacts such as tundra areas decrease in continuous permafrost, moving towards the north of the tree line and a reduced Arctic sea ice. The synthesis is based on several models and different sets. The map shows that the situation is likely to occur at the end of the XXI century (http://www.grida.no/graphicslib/detail/shift-in-climatic-zones -arctic-scenario_1154) (Figure 15). “In Russia, in general, the Pollution of the Russian Arctic Oil does not exceed the established maximum thresholds, except in some regions, particularly in the Barents Sea … In Alaska, since 2014, no major spill occurred. 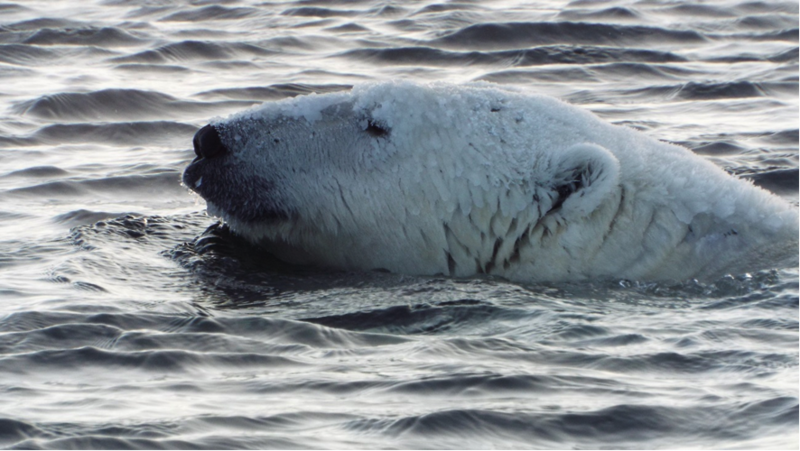 However, small chronic leaks from underwater pipelines could cause undetected release of large amounts of oil off … In Canada, since 2014, the only gas production within the range of Polar bear in the Canadian Arctic occurs in the deposit Ikhil in the Mackenzie Delta. The gas is produced from two wells, and is routed through a 50 km pipeline to Inuvik where it is used for power generation and heating … In Norway, at present, the only deposits of oil / gas subject to industrial development are those of Snøhvit and Goliat “(Action Plan – Conservation Strategy of the polar bear (draft) in August 2014). – Preserve a great range of polar bears ecological diversity and its habitat throughout the short and medium term Arctic. “To protect the environment, the precautionary approach shall be widely applied by States according to their capabilities. Where there are threats of serious or irreversible damage, lack of full scientific certainty should not be an excuse for postponing the adoption of effective measures to prevent environmental degradation. ” (Principle 15 of the Rio Declaration on Environment and Development in 1992) . Recognize that the polar bear is an important resource that plays a vital role in the social and cultural well-being of local communities in the Arctic. As well as recognize the subsistence needs of indigenous peoples in the Arctic, so that conservation is best achieved in partnership with communities traditionally dependent on polar bears and their participation in management decision making (Action Plan – Conservation Strategy of the polar bear (draft), August 2014). 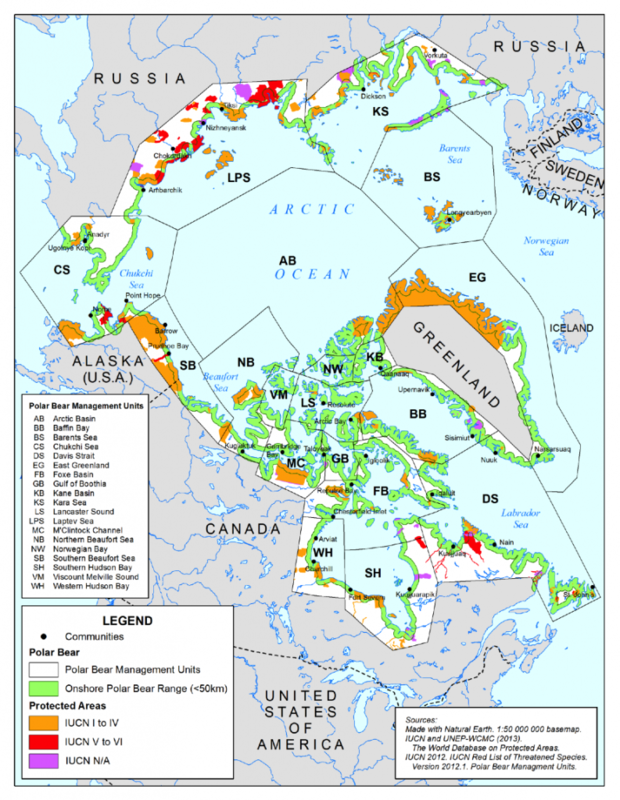 Source : Circumpolar Action Plan Draft Volume I – Conservation Strategy for the Polar Bear – August 2014. The total marine area occupied by the sub-populations in the circumpolar region is estimated at 15,523,600 square kilometers, of which about 548 600 square kilometers (4%) are protected. 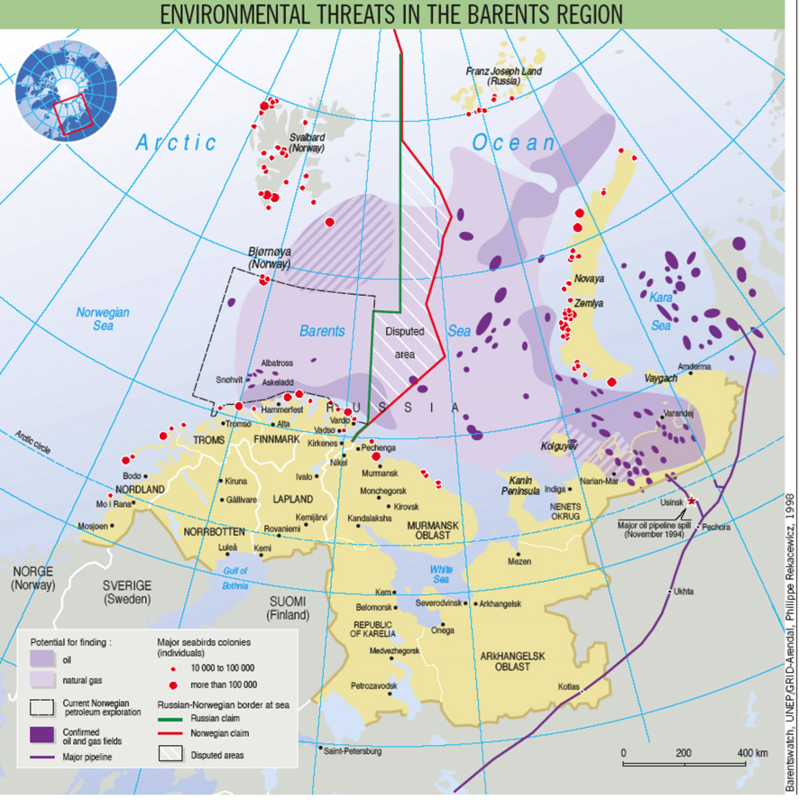 The marine protected area is about two-thirds of the protected land area (circumpolar action plan Volume I. Conservation Strategy of the polar bear, August, 2014) (Figure 14). Subpopulations habitat management systems are in place in all states based on national strategies and implementation plans that cover all areas frequented by the species. Numerous actions taken show a real will to reduce the vulnerability of ecosystems that support it. 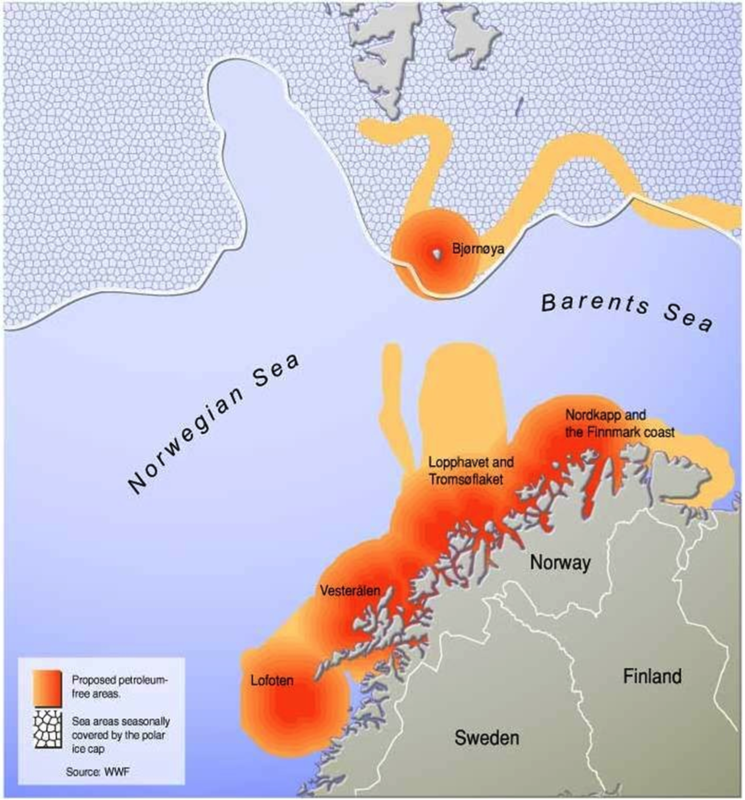 A beautiful illustration of this political will is found in Norway where we created free areas of oil exploitation in the Barents Sea (Figure 19). In Norway, with a total area of 1.4 million square kilometers, the Barents Sea is protected under the provisions of the Svalbard Act of 2002. In this region, more than 65% of the territory and 87% of marine areas are protected. A national action plan has been in force since 2013 and its revision is planned for 2018. Canada Arctic Islands are the favorite area of the polar bear which is under the authority of multiple laws. Therefore, there are five national wildlife areas, three marine protected areas, 11 national parks and 58 provincial parks land. It conducts an annual evaluation of the 13 sub-populations in the territory according to the National Conservation Strategy which was last revised in 2011. The territory covered by conservation measures covers an area of 1,763,680 square kilometers. This is primarily the Kara Sea and the Laptev Sea where applied the Federal Law on wildlife. There are four State Natural Reserves (zapovedniks) covering an area of 49,537 square kilometers, the National Russian Arctic Park with an area of 14 260 square kilometers , three national wildlife reserves, national parks and national marine reserve, five natural resource reserves of the Republic of Sakha (Yakutia). The Action Plan of the Russian Federation established in 2010 is in force until 2020. The total area covered by the conservation measures is 2,054,115 square kilometers according to the provisions of the “Greenland Home Rule Act No. 12 of October 29, 1999, Hunting and Game” and the “Executive Order on the Protection and Hunting of Polar Bear “in 2006. Protected areas in the Melville Bay covers an area of 10 500 square kilometers and the Greenland National Park with 972,000 square kilometers. An assessment of sub-populations present in the area is coming. Beaufort Sea. Subsistence hunting is regulated voluntarily through an agreement made in 1988 between the Inuvialuit of Canada and the Inupiat of Alaska (Inupiat-Inuvialuit Agreement for the Management of Polar Bears of the Southern Beaufort Sea), which promotes management based on a level of sustainable catches. The department conducts in collaboration with the North Slope Borough research activities and hunting management. 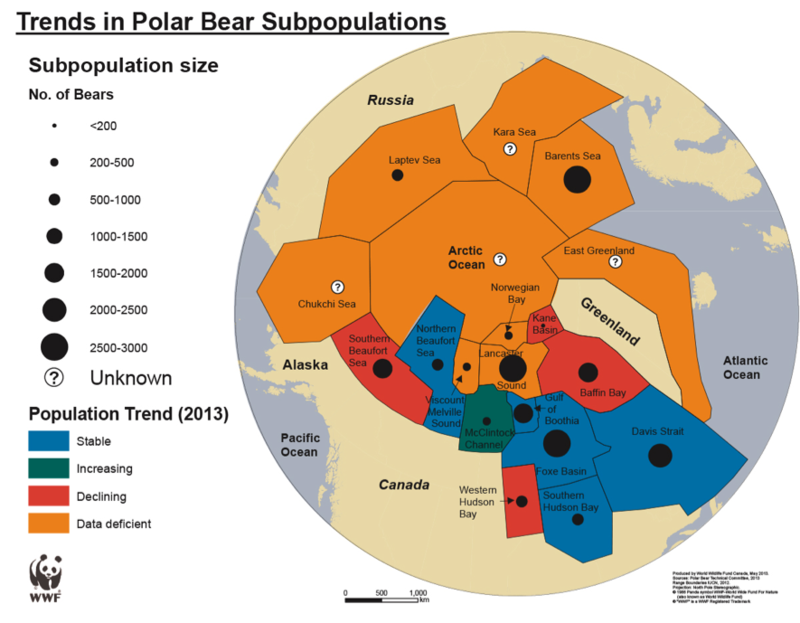 Source: Circumpolar Action Plan Draft Volume I – Conservation Strategy for the Polar Bear – August 2014. Most analyzes on the situation of the polar bear exhibit concerns about its survival after the ice will be gone. The terms used to describe the fate of the case are related to drama or disaster: The polar bear is endangered. A different view is found in Government of Nunavut that exposes a reassuring perspective: “Polar bears are very smart and quickly adapt to changing circumstances. As they have survived many climate change cycles in the past, they are likely to be able to adapt to changes that may occur in the future. However, it is quite possible that there are changes in their range and their composition. Some areas could see a fall in the polar bear population or disappearance in these regions during the hottest periods. Other regions could see an increase in the number of polar bears to measure that climate change will make the most favorable habitats for bears, driving the reduction in multi-year ice. In still other areas, the number and the reproductive rate of polar bears could remain relatively constant “(http://env.gov.nu.ca/sites/default/files/3154-315_climate_french_sm.pdf). We believe that the efforts made by members of the Polar Bear Specialist Group (PBSG) in implementing the Plan of management of polar bear habitat have given and will give good results. The objectives are ensured by law conservation of resources upon which depends the species and the decrease of subpopulation vulnerability through careful management of polar bears habitats (circumpolar action plan Volume I. Conservation Strategy of the polar bear, August 2014). “We recognize that the fight against climate change is important to the long-term conservation of polar bears. Recognize the need to manage habitat of the polar bear to reduce the vulnerability of polar bear populations and to take into account the long-term expected changes in the conditions of sea ice in the Arctic, as well as impact of these changes on polar bears and their prey “(circumpolar action plan Volume I. Polar Bear Conservation Strategy, August 2014). “The Inuit have always had the ability to adapt to change, and change happens very quickly. If we adapt this is done partly at the expense of our health, our families and our culture. We are committed – to oppose the elements that cause harm to the population – and to make positive, achievable changes that will allow us to be better prepared to face the future. “Tamapta: Our Future Together”. – Piita Kattuk, member of the Eeyou Marine Region Wildlife Board, Sanikiluaq, Nunavut, Canada. – Sophie Fillion, Wildlife Liaison Officer, Eeyou Marine Region Wildlife Board. CANADIAN WILDLIFE SERVICE. 2011. National Polar Bear Conservation Strategy for Canada. Ottawa. August 2011. 23 pages. CANADIAN WILDLIFE SERVICE. 2011. National Polar Bear Conservation Strategy for Canada. Summary. Ottawa. August 2011. 7 pages. INUIT TAPIRIIT KANATAMI. 2003. Inuit Kanatami. 36 pages. NUNAVIK MARINE REGION BOARD. 2014. Public Hearing. Establishment of a Total Allowable Take for the Southern Hudson Bay Polar Bear Subpopulation. February 12th – 14th, 2014. Inukjuak, QC. OBBARD, Martyn E., Kevin R. Middel, Seth Stapleton, Isabelle Thibault, Vincent Brodeur, and Charles Jutras. 2013. Wildlife Research Series 2013-01. Estimating abundance of the Southern Hudson Bay polar bear subpopulation using aerial surveys, 2011 and 2012. 33 pages. POLAR BEAR SPECIALISTS GROUP. 2014. Plan d’action circumpolaire volume I (ébauche). Stratégie de conservation de l’ours blanc. August 2014. 74 pages. POLAR BEAR SPECIALISTS GROUP. 2015. 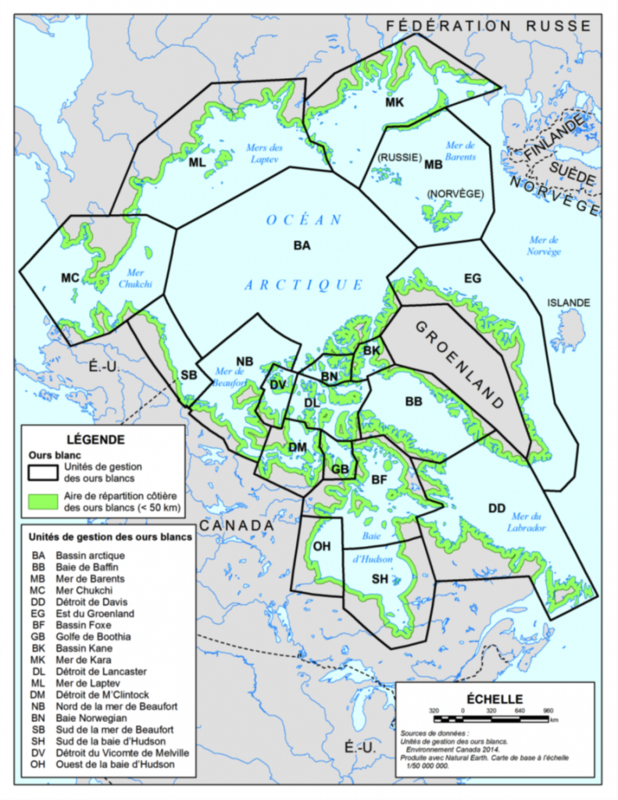 États de l’aire de répartition de l’ours blanc. Plan d’action circumpolaire pour l’ours blanc. Partie II. February 11, 2015. 39 pages. Jules Dufour, Ph.D., C.Q.. is Emeritus Professor of Geography , University of Quebec, Research Associate, Centre for Research on Globalization.